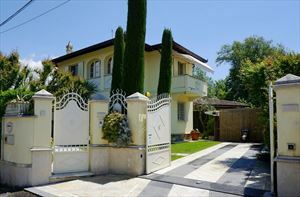 Splendid Detached Villa with swimming pool located in a quiet area in Forte dei Marmi, 1.2 km from the sea. 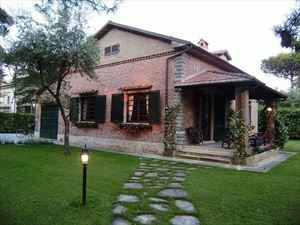 Outside there is a closed veranda with a wood oven and a dining table. The ground floor includes an entrance hall with dining room and living room, adjoining a kitchen with access to the veranda, a bathroom with shower and garage. On the first floor we find a double bedroom with bathroom with shower, while the second floor includes two double bedrooms and a bathroom with shower. 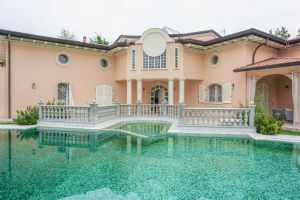 The Villa is also equipped with an alarm system, air conditioning, automatic gate, Wi-Fi Internet connection and parking.